This course ranks #3 against all reviewed courses. 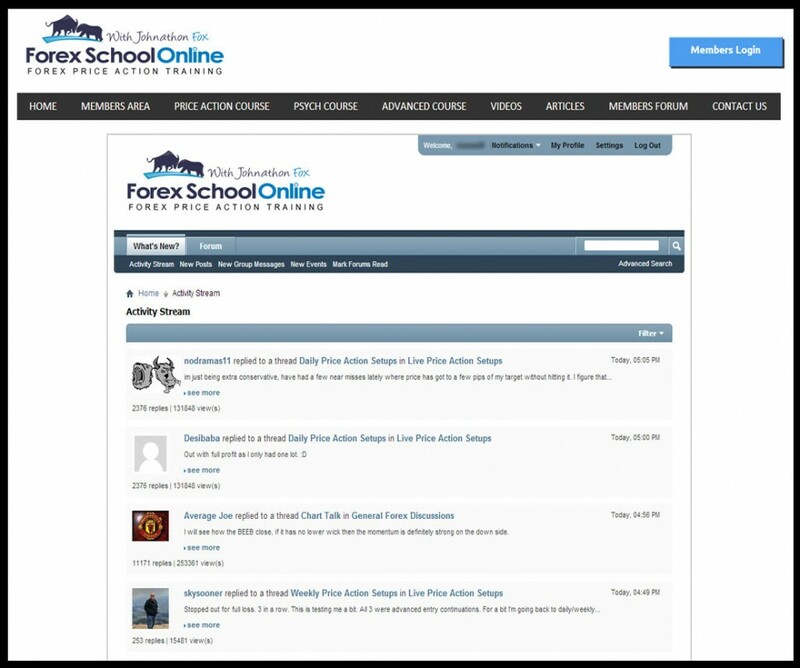 Forex School Online premium course basically consists of three parts. 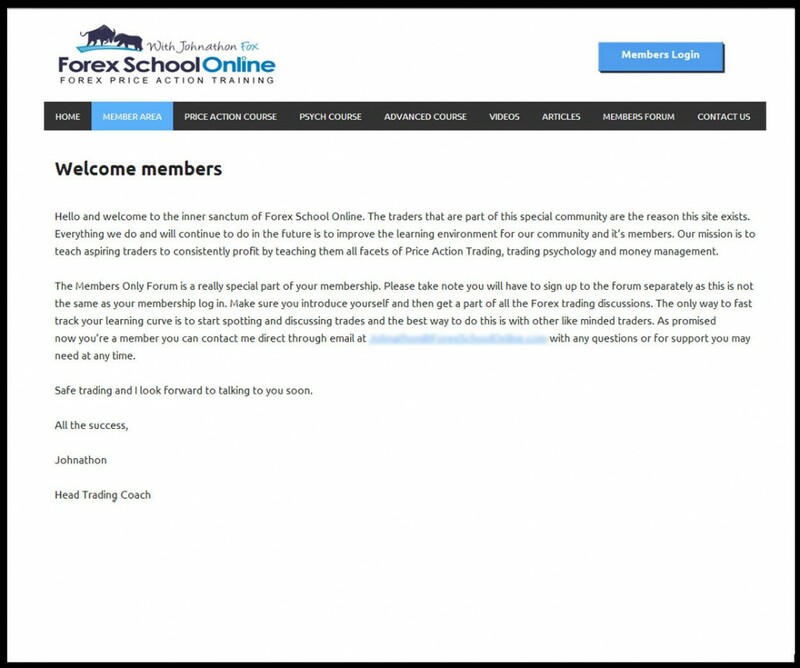 Johnathon Fox, the head of this course explains the concept relating to forex trading in solid detail. He uses some examples and graphical illustrations to help illustrate his ideas. Mr. Fox placed some decent emphasis on trading psychology with a couple solid ideas. 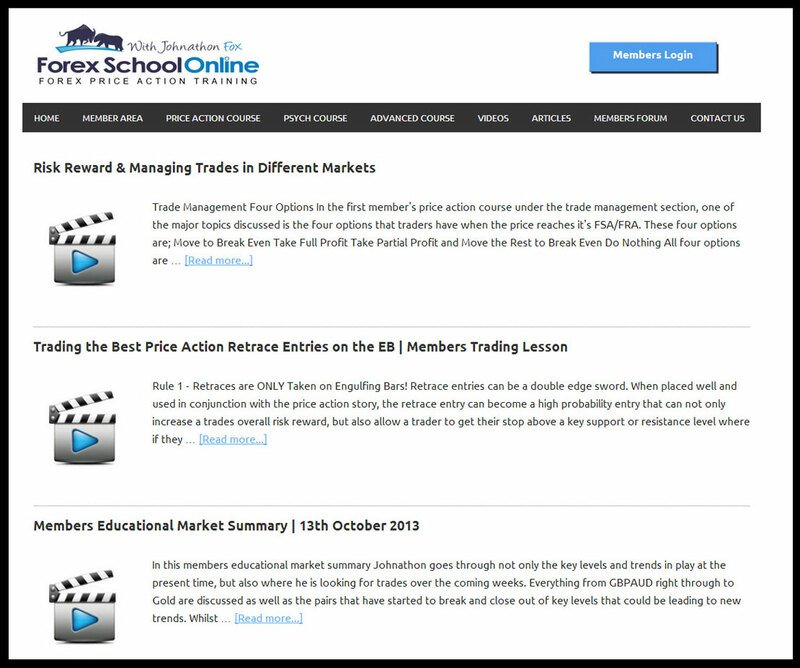 In addition to the educational course, the premium members also get access to a discussion forum, video library, articles library, markets analysis and webinar sections. The administrator (presumably Johnathon himself) is solidly active in the discussion forum and other parts of the premium zone, but not in the webinar section. The Trading Head Coach (Administrator) answers the queries of the premium members individually. The trade setups and market analysis posts are also being shared in the paid section regularly. However, the webinar section has not been updated for the last two years. Quality & Value Of The Premium Content? 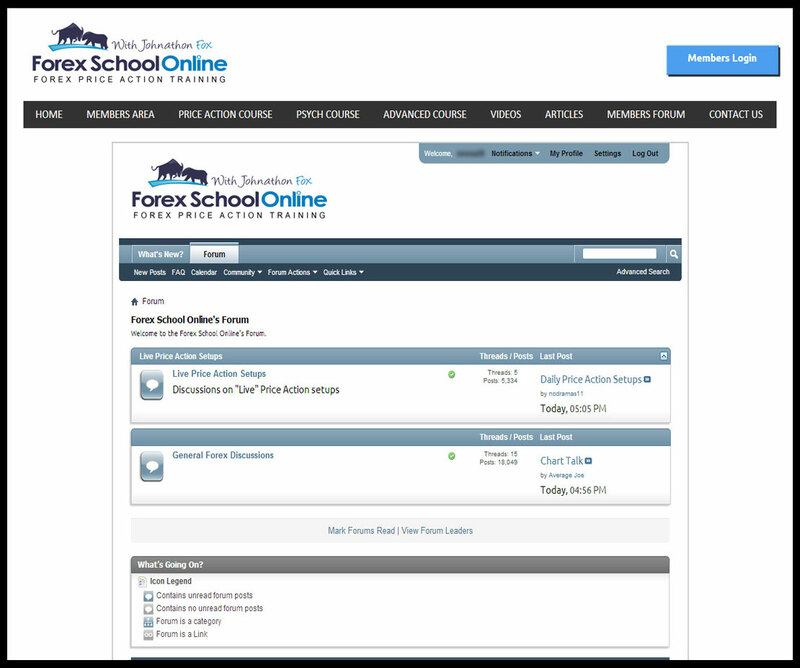 Although there is some quality information available, those of you familiar with James 16 materials will notice that much of the information in Forex School Online is very similar. We couldn’t find a quiz section in the paid course, so it was a little disappointing that there is no way to test your knowledge after course lessons. Introduction: This chapter introduces forex trading and various aspects of the course that will be covered in the future. What is Price Action: Explains the basics of price action, and what PA strategies a paid member will learn through the Forex School Online course. What is an edge? This chapter explains what an edge is in forex trading, a few examples of edges, and why you need them. Chart Setup and Best Time Frame: Explains the importance of New York Close charts, types of charts, and appropriate time frames for successful trading. Johnathon Fox only supports trading higher time frames, which was a little disappointing, especially with Johnathon stating the only way to make consistent money trading forex was by using higher time frames, which we disagree with. Best Time For Entry? This chapter is all about various trading sessions. Defining Trend: Covers basic types of markets, identification of trend, chart examples and basic concepts behind support/resistance levels. Change in Trend: This chapter explains standard methods to determine change in the trend using charts. Not much in-depth information. Broken Support/Resistance Levels: This chapter explains how to trade broken support and resistance levels. Ranging Markets: When the market does not move a lot or shows a lack of volatility, then such a market is known as a ranging market. The chapter explains why it is not wise to trade in the ranging markets. We thought this was interesting since he is contradicting himself saying there are certain ranges you should trade, however there was no further explanation for this contradiction. S/R Levels & Round Numbers: Explains how to make support & resistance levels, identifying key horizontal areas and significance of round numbers around major S/R. Price Flipping: This chapter explains, with the help of chart examples, how a specific support/resistance level might act exactly opposite after a breakout. Seems like an old concept that has been re-hashed, but useful for absolute beginners. Big Round Numbers: Discusses major round numbers, also known as psychological levels such as 2.000 for GBP/USD, 1.0000 for AUD/USD etc. Pin Bar Reversal: This chapter is all about pin bars; it explains what a bullish or bearish pin bar is, how it works, and how to trade pin bars. Bullish & Bearish Engulfing Bars: This chapter is about engulfing bar candles for reversals as compared to pin bars. Two Bar Reversal Pattern: This chapter is about another reversal pattern known as a two bar reversal. It explains exactly what this pattern is and how to trade it. The Pin-gulfing Bar: This is a combination of a pin bar and engulfing bar candles. It is essentially a special name given to a combination of a pin bar and engulfing bar, even though it is traded the same as an engulfing bar. The False Break: This chapter is about a false break. You can see some types of false breaks and graphical demonstrations. Price Action & Fibonacci: According to the author, Price action is incomplete without Fibonacci retracement and extension levels. We thought this was a little strange to make them dependent upon each other without good reasoning behind it. Trading Reversal Vs Continuation Signals: In this chapter the writer explained the difference between reversal and continuation signals, with some basic strategies on how to trade both. Profit Taking & Trade Management: In this section Johnathon taught some tips/techniques for trade management and profit taking. 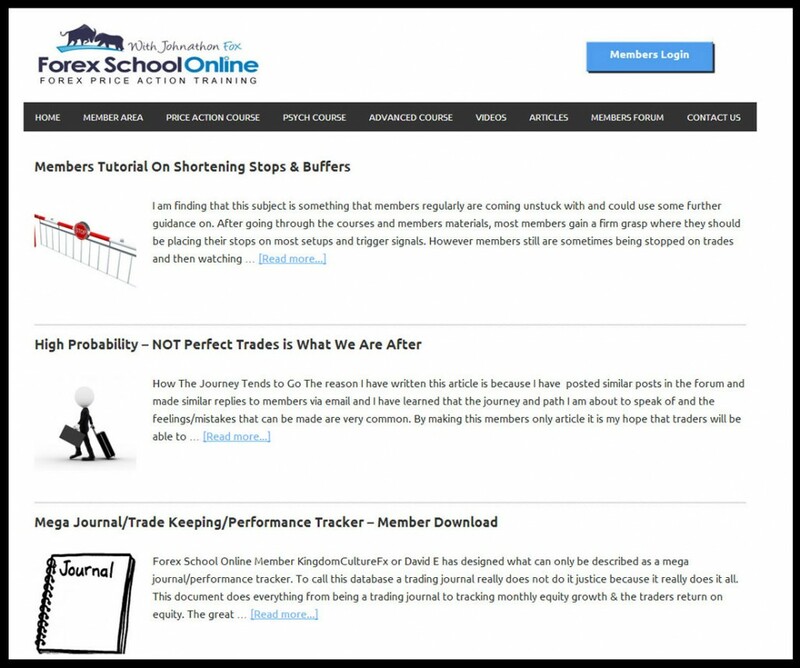 Making A Pre-Trade Plan: In this chapter Johnathon explained how to develop a pre-trade plan. This section consists of graphical examples. Demo, Demo & Demo: After teaching different aspects about trading, Johnathon urged beginner traders to stick to demo trading for quite some time. In this chapter he discusses various aspects of demo trading. Forex Trading Psychology: Here Johnathon discussed various concepts relating to trading psychology such as trading with fear, over trading, trading with greed and various emotional trading mistakes. Money Management: There is a discussion about various aspects pertaining to money management such as position sizing, leverage of brokerage etc. 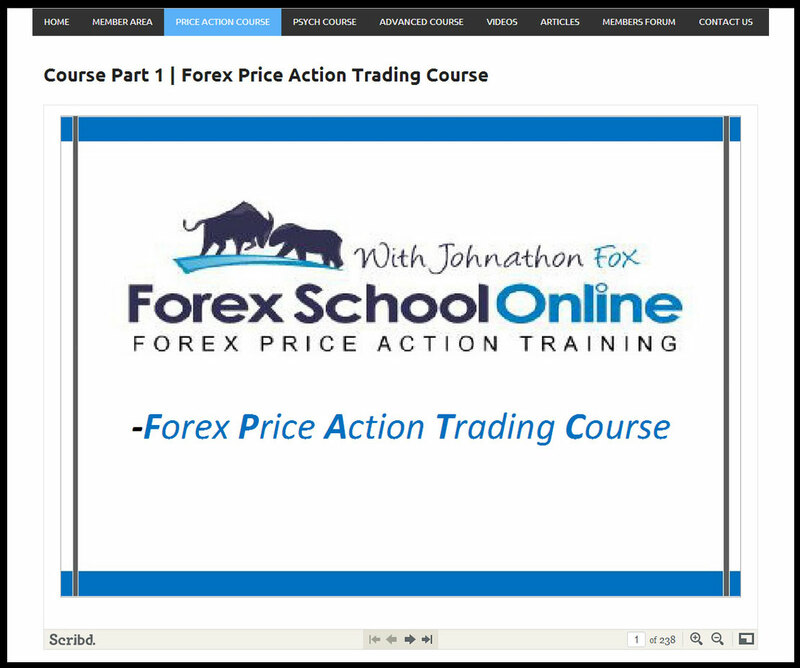 Part 2 – The second part of the course covers various price action strategies, followed by a brief summary of different topics to be discussed in this section of the course. Breakout: Johnathon talks about trading breakouts as a signal for continuation of the ongoing trend. He explains how to identify and trade a valid breakout in forex trading, but only in the context of a pullback setup after the breakout. Breakouts with Inside Bar: In this chapter, Johnathon discusses the inside bar breakout strategy. He explained various guidelines relating to a valid inside bar trade setup and how to trade fake inside bar setups. Using Engulfing Bar as Continuation: Johnathon explained, with the help of examples, that the engulfing bar pattern (if emerged within the same trend) could generate a signal for the continuation of the existing trend. Inside Bar as Continuation: In this chapter, Johnathon talked about when an inside bar trade setup generates a continuation signal and how to trade these types of patterns. Trade Management: At the end of part two, Johnathon Fox discussed various trade management strategies. Part 3 – The third part is all about trading psychology. In this section Johnathon discussed various aspects relating to psychology of a trader such as overtrading, greed and emotional decisions. Market Commentary: This section contains daily trade ideas posted by the Head Trading Coach (Administrator) as well as the members. The admin is very active in the forum and regularly participates in the discussions relating to various trade setups. General Forex Discussion: In this section, members can share anything related to forex, they can even ask questions which are not addressed in the course and their queries are answered by the administrator. In addition to the listed above, the video library contains tutorials relating to price action and other aspects of trading. We must acknowledge that Johnathon explained various topics that are also available for free online. This section contains some educational articles on forex trading. The articles range from money management to trading psychology, and price action to fundamental analysis. It contains latest trade setups prepared by the Head Trading Coach (Administrator). The trade setups are shared regularly. Members may also share their own opinions or queries in this section. Here, Johnathon shares tips and guidelines on how to deal with emotions in trading, how to stick to the trading plan, and how to avoid overtrading. It seems that Jonathan does not focus much on this section anymore, yet it was advertised as a member’s only benefit.